Enterprises can configure cellular settings for tablets and PC that have built-in cellular modems or plug-in USB modem dongles and apply the settings in a provisioning package. After the devices are configured, users are automatically connected using the access point name (APN) defined by the enterprise without needing to manually connect. For users who work in different locations, you can configure one APN to connect when the users are at work and a different APN when the users are traveling. You can get the APN from your mobile operator. 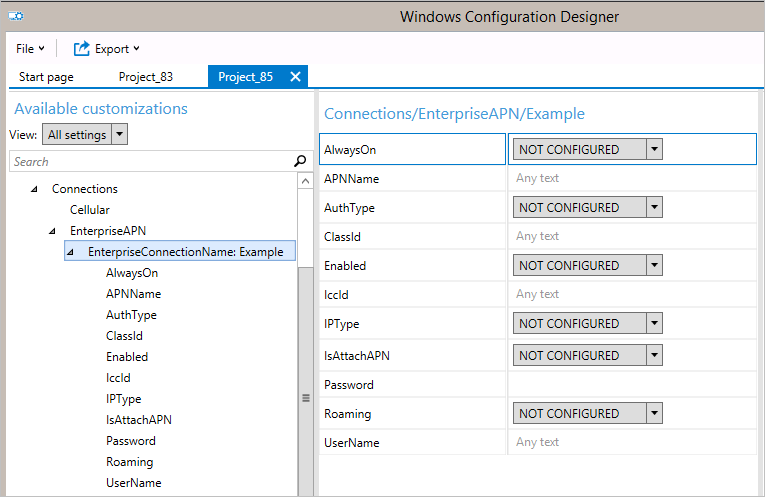 In Windows Configuration Designer, start a new project using the Advanced provisioning option. Enter a name for your project, and then click Next. Select All Windows desktop editions, click Next, and then click Finish. Go to Runtime settings > Connections > EnterpriseAPN. Enter a name for the connection, and then click Add. The connection appears in the Available customizations pane. Select it to view the settings that you can configure for the connection. The following table describes the settings available for the connection. AlwaysOn By default, the Connection Manager will automatically attempt to connect to the APN when a connection is available. You can disable this setting. APNName Enter the name of the APN. AuthType You can select None (the default), or specify Auto, PAP, CHAP, or MSCHAPv2 authentication. If you select PAP, CHAP, or MSCHAPv2 authentication, you must also enter a user name and password. ClassId This is a GUID that defines the APN class to the modem. This is only required when IsAttachAPN is true and the attach APN is not only used as the Internet APN. Enabled By default, the connection is enabled. You can change this setting. IccId This is the Integrated Circuit Card ID (ICCID) associated with the cellular connection profile. IPType By default, the connection can use IPv4 and IPv6 concurrently. You can change this setting to only IPv4, only IPv6, or IPv6 with IPv4 provided by 46xlat. IsAttachAPN Specify whether this APN should be requested as part of an LTE Attach. Password If you select PAP, CHAP, or MSCHAPv2 authentication, enter a password that corresponds to the user name. UserName If you select PAP, CHAP, or MSCHAPv2 authentication, enter a user name. After you configure the connection settings, build the provisioning package. Apply the package to devices. After you apply the provisioning package, you can confirm that the settings have been applied. On the configured device, open a command prompt as an administrator. netsh mbn show profiles name="name"
This command will list details for that profile, including Access Point Name. netsh mbn show connection interface="name"
The result of that command will show details for the cellular interface, including Access Point Name.